The Pinacol Rearrangement involves the shift of an alkyl group accompanied by loss of water and the conversion of an alcohol to a ketone (or aldehyde). The Pinacol rearrangement is a method for converting a 1,2-diol to a carbonyl compound. The 1,2-rearrangement takes place under acidic conditions. This reaction proceeds through the positively charges intermediate in which the methyl group migrates from one carbon atom to other. In the first step, the hydroxide is protonated in the presence of acid (sulfuric acid in this case) and becomes a good leaving group. When water is removed, the carbocation is formed. This is a stable molecule because it is tertiary carbocation. In the next step, rearrangement takes place and the methyl group gets shifted to the positive carbon. Then, water removed the proton and carbonyl compound is formed. In this example, the starting diol is symmetric and it is not important which hydroxy group will protonate in the first step. 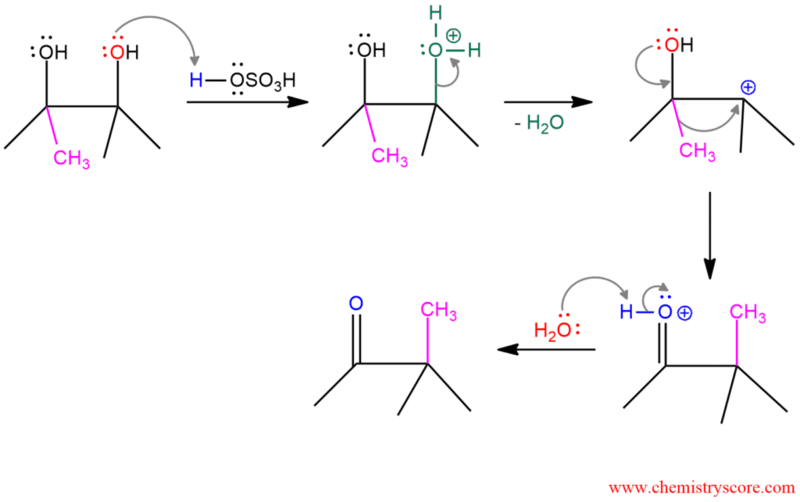 But when the starting diol is unsymmetrical, the hydroxy group that forms a more stable carbocation will protonate (in a better yield). This means that the mixture of products will be obtained. So the Pinacol rearrangement is regioselective, and the major or only product is derived from the rearrangement of the more stable carbocation.